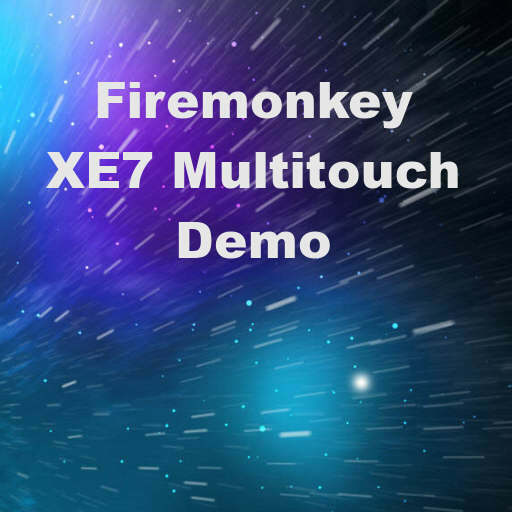 Developer Andrey Yefimov created a demo of the new multitouch capabilities in Delphi XE7 Firemonkey. You should be able to use the multitouch functionality on Android and IOS devices. The demo uses the TForm.OnFormTouch event to show a TLabel containing the X and Y position of each touch on the device screen. I placed all 10 fingers on the surface of a Nexus 7 tablet and it handled all ten touches. It displays the number of touches being handled in a TLabel. It does this by looping though a touch object and accessing a location property for each touch within the touch object. With the code so far you should be able to create multitouch drawing functionality really easily. Source code is available over on the original blog post and I have also included my sample project below. The original blog is in Russian so use Google Chrome to translate. If you are using Delphi XE5 or Delphi XE6 you can handle multitouch with this custom code. The latest version of AppMethod should also support multitouch when available. Head over and check out the full blog post plus source code for accessing multitouch events in Delphi XE7 Firemonkey.